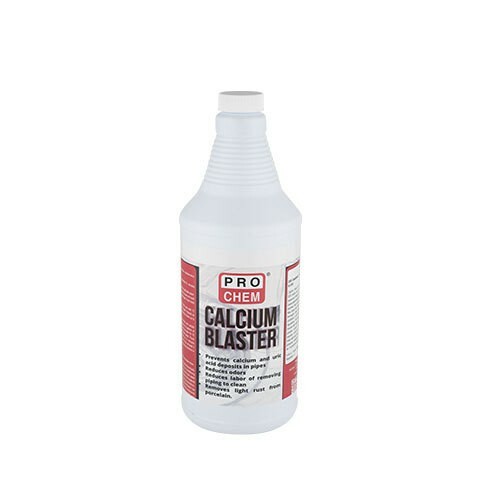 Calcium Blaster | Pro Chem, Inc.
CALCIUM BLASTER effectively removes scale and mineral build-up from toilets, urinals, drinking fountains, air conditioning equipment, ice machines, cooling towers and most water drain lines. It rapidly penetrates and dissolves the toughest calcium, uric salts, magnesium, sodium, lime accumulations, light rust, and other minerals deposits. It has a combination of penetrating agents, degreasing compounds and corrosion inhibitors that even outperform straight acid-based products. It is safe for all plumbing, including PVC plastics and all metal pipes. Plumbing: For best results use on a preventative maintenance program. Urinals: Add 8 ounces and allow to stand for 15 minutes, then flush with water. Toilet Bowl: Flush the toilet and allow to refill with water. Add 8-ounces of Calcium Blaster into the bowl and wait 15 minutes. Use a brush to clean toilet bowl. Flush toilet and repeat. Drains: Pour 8-12 ounces into the drain and wait 15 minutes. Flush drain with 2 gallons of water. Repeat as necessary. Ice Machines: Close water supply valve and isolate refrigeration circulation. Add 12 ounces to 2 gallons of water in reservoir. Start circulation and circulate for 10 minutes. Drain reservoir and fill with fresh water. Flush pump, nozzles, chutes and reservoir for 5 minutes with fresh water and drain the reservoir. Run at least 2 batches of cubes and discard before placing machine in production. Cleaning: Spray CALCIUM BLASTER directly on surfaces and wipe clean.